The compact and rectangular design of this scale is known buy every French people as the grand-ma scale. Since then, things changed, excepted the BA 2000 kitchen scale. The vintage collection brings it up-to-date in its brightest red. All began in 1966, when Paul Terraillon met for the first time the famous designer Marco Zanuso in Milano. 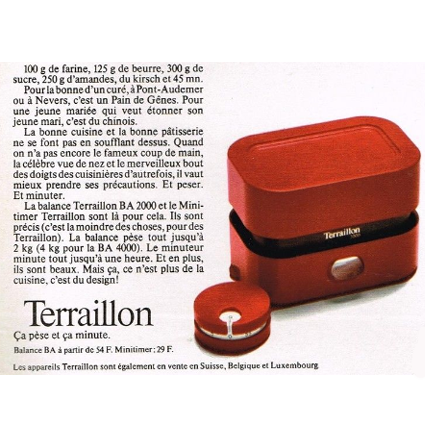 Their collaboration becomes quickly apparent and will lead to the creation of several devices, one of which was the mechanical kitchen scale BA 2000. Its compact and ingenious shape will quickly become the must-have in every kitchen during the 70's but also apart of the MoMA's exhibition. Practical thanks to its included bowl, efficient thanks to its dial easy to read, and most of all, precise, that's the BA 2000 kitchen scale, but not only ! 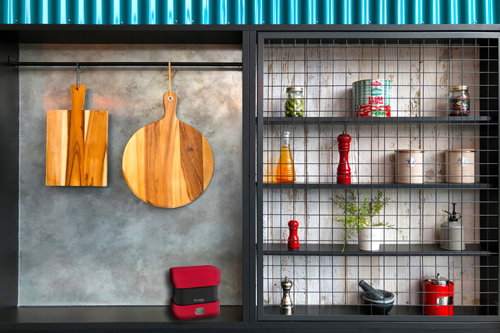 The BA 2000 will also give the final touch to your kitchen's design with its unique design and bright red. Compact: wash your container, return it on your BA 2000 and your mechanical kitchen scale is ready to be stored even in the smallest spaces.